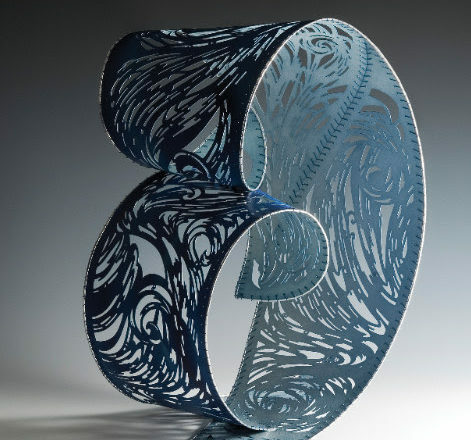 “Touch,” katagami sculpture by Jennifer Falck Linssen. Seven sculptors from throughout the United States and Scotland display works that celebrate the transformative power of paper in the exhibition Pulp & Possibilities at Peninsula School of Art in Fish Creek. On view from Aug. 19 – Oct. 15 in the school’s Guenzel Gallery, the exhibition features layered papercuts, origami, katagami, papier-mâché, pop-up books, and the animation of paper sculpture. Featured artists are: Jennifer Falck Linssen, Dinh Giang, Tiffany Ownbey, Krista Reuter, Kathleen Scott, Shawn Sheehy and Charles Young. Linssen employs the katagami stencil making process typically used for resist dyeing of a single kimono. She carves into bonded layers of mulberry paper with specialized sharp tools and then shapes the overall form of the paper. The origami sculptures of Giang are rooted in the Zen philosophy of simplicity. He employs basic design principles to bring life to his figures, which are created in heavyweight watercolor paper with the wet-folding technique. Scott and Young create movement in their paper sculpture through stop-motion animation. Young has created more than 550 designs with watercolor paper and glue that range from realistic to whimsical. The structures form a series of islands that are incorporated into a growing city. The showing of his minute-long video, Paperports, demonstrates the artist’s technique. Scott animates papercuts in her video The West, which features a desolate landscape inhabited most notably by a hawk. The artist not only created the music for the short film but employed techniques to give it a rustic, antique feeling. Light and shadow are also integral to the layered works of Reuter. Using either handcut or torn paper, an interplay of depth sets the stage for abstract patterns and shapes found in nature. Nature as a theme is interpreted realistically in the pop-up books of Sheehy. Welcome to the Neighborwood explores the relationship between humans and nature. He creates his own paper for his handmade books. Ownbey enhances pulp’s possibilities as an art medium by using recycled antique sewing patterns, vintage books, and repurposed objects in her figurative, papier-mâché works. Pulp & Possibilities is free and open to the public. A complimentary hands-on component is featured in the exhibition. Materials and instructions are provided for gallery visitors to create a sleeping bear through wet-fold origami.